The Echo Spot might looks like a cross between a Nest home thermostat and a bedside clock but it’s so much more. The Amazon Echo Spot is the ultimate artificially intelligent home assistant. The Amazon Echo Spot is what you’d get if the Echo Dot and the Echo Show had a baby. That means it’s compact in form but also contains a screen. Alexa is built-in meaning everything is controlled by your voice but you also have that 2.5-inch display to get more back than just words. 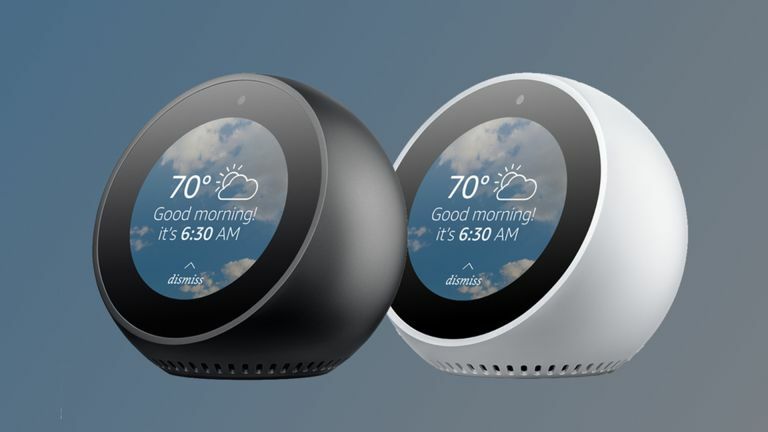 The Echo Spot can be used to make video calls with its built-in sound plus a line-out and Bluetooth allow you to turn speakers into smart audio devices. The Spot can manage lots of other functions that the Echo Show offers, meaning you could potentially use it to see who’s on your home video camera, like Nest. Or if this is by the bed, you can see a baby monitor display and control lights without moving from bed. It also makes shopping a more visual experience, shows you song lyrics, plays weather forecasts, news flash briefings and more. Since this is punted as a bedside device it’ll be nice to see data like weather and calendar laid out without having it read out to you first thing in the morning. Little else is known about the Echo Spot after Amazon’s surprise reveal event. What we do know is that it’ll launch priced at $130 (£97) in the US but will make its way to the UK in 2018. Amazon also announced a new Echo and Echo Plus as well as a new 4K Fire TV and Echo Buttons and UK Echo Show release details.